Serena Perrone’s (American, b. 1979) series of intaglio and gouache prints layer color, line, and text to create narratives that are part fiction and part chronicle. Perrone’s work is in direct response to the tragic loss of UW professor and poet Craig Arnold in April of 2009. 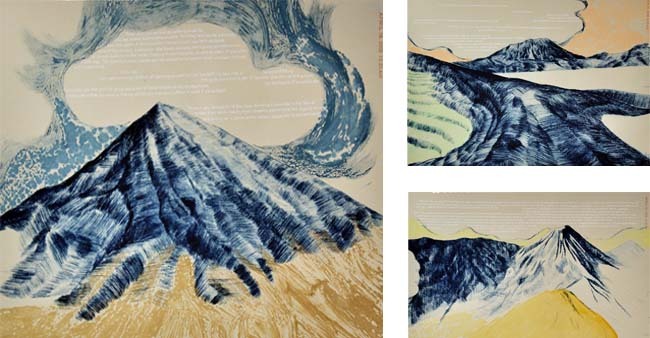 This series of twenty prints represents Arnold’s twenty days of travel in Japan where he was visiting to study volcanoes for a new book. Laid over the images of sky, earth, or volcano is text taken from Arnold’s travel blog. Perrone explores narratives, both in the subject of her prints and in the context of the viewer’s expectations and experiences. Perrone received her MFA in Printmaking from Rhode Island School of Design and holds a BFA in Painting, a BA in Art History, and a BA in French from Southern Illinois University. She has received numerous visiting artist residencies and fellowships, including a fellowship from the Emerging Visual Arts Career Development Program in Philadelphia. She is represented by Cade Tompkins Projects in Providence, RI.